Although this fan fiction is not graphic in its depiction of a m/f romance and violence there are a few moments that may be "pushing the envelope" or could be considered overly suggestive. 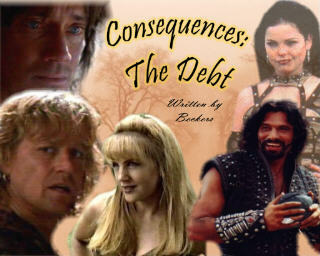 Because of this possibility a rating of PG13 (possibly a mild R) has been given to CONSEQUENCES: THE DEBT. Please read with caution. Please do not take anything from this website, be it text or art work, with permission from Beckers.